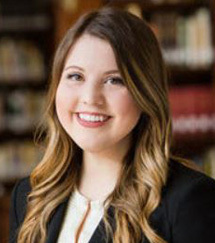 Rachel Lanier joined the Lanier Law Firm’s New York office as an associate in 2016 and practices in the areas of toxic torts, pharmaceutical litigation, mass torts, and product liability. In 2017, Ms. Lanier served on the Firm’s trial team in the Pinnacle hip implant litigation against DePuy Orthopaedics, Inc. which led to a $247 million dollar verdict in favor of plaintiffs. In summer 2018, Ms. Lanier worked with the trial team in St. Louis, Missouri to represent twenty two plaintiffs in the Talcum Powder litigation against Johnson & Johnson which resulted in a $4.7 billion dollar verdict for the plaintiffs. Ms. Lanier was recently recognized as a 2018 New York Rising Star in the practice area of personal injury – products and is a member of the American Bar Association, American Association for Justice, New York Bar Association, and New Jersey Bar Association. She enjoys speaking at Continuing Legal Education seminars, and recently participated in a breakout panel at the annual Mass Torts Made Perfect seminar in Las Vegas, NV. In September 2018, Ms. Lanier spoke on the recent Talc verdict at the HarrisMartin MDL Conference in Napa, CA, and in October presented at the HarrisMartin Talc and Asbestos Conference in Miami Beach, FL. She will soon participate on a panel at the Annual Complex Litigation Symposium in Louisiana.